I’m a big advocate of equal opportunities, irrespective of gender and background. Having previously worked in a male-dominated sector which benefited greatly from initiatives to address gender inequality, I recognise the difficulty in changing something that can sometimes feel so ingrained. When I decided to embark on a career within the nuclear industry, it made perfect sense for me to join Women in Nuclear and continue in my advocacy of equal opportunities. Women in Nuclear UK (WiN UK) is a branch of the Nuclear Institute, to which membership is included if you subscribe to the latter. They have a mission to attract more women to a career in the nuclear industry, support those who are working within the sector and promote open engagement with the public on nuclear issues. By signing the WiN UK Industry Charter, a business can show that they are committed to encouraging the WiN ideologies, without the pressure of a monetary subscription or formal strategy in place. I found it very reassuring to find out that so many companies have already signed up to this, ranging from SME’s to multi-nationals! 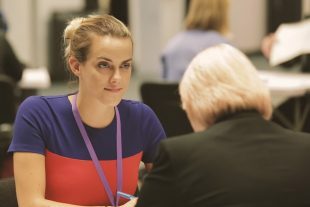 I was due to attend the Nuclear Decommissioning Supply Chain Event in Manchester, and whilst browsing the website, happened on some information about WiN speed mentoring. This involved a number of 5 minute conversations on a topic of my choice, with a range of industry professionals who had volunteered to be mentors. Suitably intrigued and thinking that at the very least this would be a great place to meet people, I signed myself up. As a starter for ten, I had to provide some background information about myself and a question or topic that I would like to discuss with the mentors. Having recently started within the industry, I wanted to keep my question quite broad and open ended to inspire discussion. With that in mind, my chosen question largely dealt with figuring out what my strengths and weaknesses are and how to decide on what career path to follow. 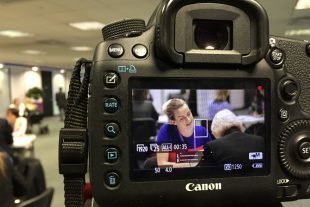 Armed with my question and an open mind, I arrived at the mentoring area and was pleasantly surprised to see how many mentors, both male and female, had signed-up to take part. As how the session would work was explained, it became apparent that it would be pretty informal with a much needed break for treats. With the start signalled with a clink of glass, I sat down and embarked upon an hour long session that provided me with much more useful advice and contacts than I had anticipated before the event! A key bit of counsel that has stayed with me was that many of the mentors would never have imagined that they would end up in the role that they currently held, and were always looking at new challenges and avenues to explore. Staying with that train of thought, the advice that resonated with me the most was to be as open to new opportunities and feedback as possible and to recognise that your strengths normally align with what you love doing – a very simple concept that can be easily overlooked. Whilst it was great to get advice on my set topic, I really enjoyed hearing about the mentors’ backgrounds and their views. Networking is so incredibly important and I personally found it refreshing to meet so many wonderfully like-minded, passionate individuals, who were willing to give up their time for a discussion with no hidden agenda! I was also encouraged by John Clarke's (NDA CEO) words as he spoke at the supply chain event. He encourages the industry and women to embrace the opportunities ahead, saying that without positive steps in this direction for women, the industry "is excluding talent". All in all, the speed mentoring session was a very worthwhile experience, and one which I will definitely take part in again in the future. So if you are female and interested in developing a career in nuclear or just interested in supporting gender balance in the industry, then find out more from Women In Nuclear.